TF Cornerstone building at 4720 Center Blvd. LONG ISLAND CITY — In a highly unusual move, Community Board 2 adopted a resolution Thursday night supporting workers’ rights to unionize and to seek fair compensation. The vote comes about four months after one of the city’s most powerful labor unions, 32BJ, asked for the board’s support in its dispute with a developer. 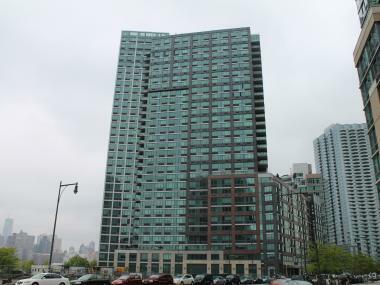 The union claims that TF Cornerstone, a real estate firm that owns a luxury Queens high-rise at 4720 Center Blvd. with primes view of the United Nations, has prevented the building’s workers from unionizing and has failed to provide decent benefits, job security and adequate industry-standard training. 32BJ also contends that of the building’s 22 employees, 12 had expressed an interest in joining the union. Union workers have been coming to Community Board meetings in Sunnyside since February this year, always bringing many speakers presenting its position. “When workers make a good living, they support the community,” said Lenore Friedlaender, a Sunnyside resident and Vice President of 32BJ. 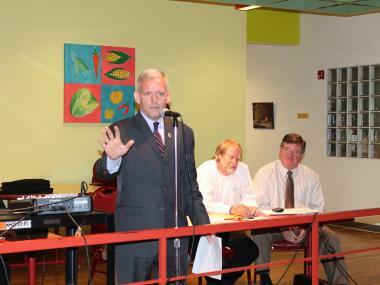 Community Board 2 had mulled the issue for months, citing a need for more information. In May, the board received a letter from TF Cornerstone’s executive Vice President, Kevin Singleton, saying that the company’s benefit package is superior to the one offered by 32BJ. “[…] If the majority of building employees in a particular building democratically vote to unionize, we then recognize the union as their bargaining agent and operate that building as a union facility,” the letter said. In a phone conversation with DNAinfo.com last month, the developer said that most of the building’s employees did not want to join the union. Not all board members agreed. “It’s an issue for the National Labor Relations Board, not community board,” argued board member, Carol Terrano. Some members abstained from vote and one voted against it, but the majority supported the resolution. Board Chairman Joseph Conley said the board was careful with the wording so that the resolution primarily expressed general support for workers’ rights. It also expresses support for workers’ right to seek to organize as a collective bargaining unit in order to negotiate with their employer.